The shores of the Province of Pesaro-Urbino go from the mouth of River Tavollo to the mouth of Cesano, with 40 km of beaches. Gabicce offers wide sandy beaches placed on two different levels: one laying on a small bay and Gabicce Monte, perched on top of a cliff, offering at the same time fun nighttime activities with restaurants, pizzerias and night club. Pesaro offers the same wide beaches and a quite resort life. 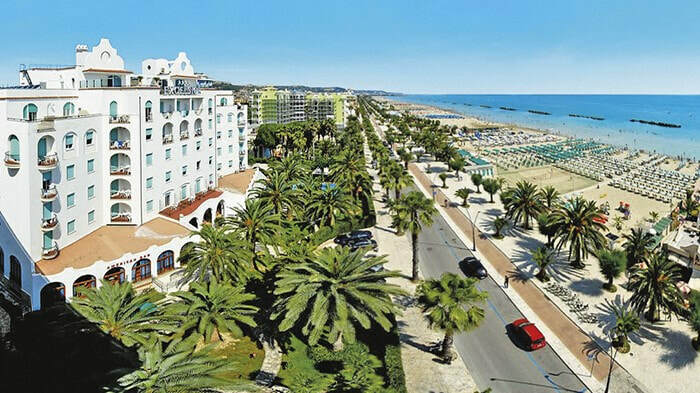 Fano features two resort areas: the Lido which is short and sandy and the Sassionia which lays between a pictoresque fishing port. Senigallia offers 12 km of white and sandy beaches with a very tidy and welcoming city. In Ancona, there are different beaches worth mentioning: Passetto, with an equipped park and double white stairway to reach the sea below. The second beach worth mentioning is the Bay of Portonovo, an unspoilt wonder of nature, an ideal desination for people who are looking for an extraordinary place to spend a relaxing holiday. From here it stars one of the most beautiful seashore of the entire Adriatic coast, called "Conero Riviera". In Sirolo there are many beaches from which tourist can choose, but the four most beautiful ones are for sure: Spiaggia Urbani, Spiaggia Sassi Neri, Spiaggia San Michele and le Due Sorelle (two grand rock spurs rising from the sea). Moreover the Riviera del Conero has stunning beaches troughout the city of Numana, Marcelli and Porto Recanati. After Porto Recanati tourist can find Porto Potenza Picena and Civitanova Marche with its long beaches divided by fishing and tourist ports. Here, many sports and art events are held during summer time. The geographical position allows the city to be one of the most important city of the region, since it connects the principal locations of the region. To the south there is Porto Sant'Elpidio, an old sailor's village, now an important industrial centre and a rather well equipped seaside resort. A few kilometres away are Lido di Fermo and Porto San Giorgio, an important industrial and bathing centre, with a medieval core and equipped for every kind of tourism. There are also the city of Pedaso and Cupra Marittima with soft beaches. After Cupra Marittima there is Porto D'Ascoli with vast and sandy beaches with an amazing background of palms and oleanders. Lastly there are Grottammare and San Benedetto del Tronto. The former has a medieval core on a picturesque hill towards the sea, surrounded by ancient walls and of a modern seaside town with villas, restaurant and sea resorts. The latter is the major sea resort of the region; the main attraction is the vast and beautiful sandy beaches along with luxurious and relaxing little gardens.